Allegorical depictions of the French Revolution were popular in pro-revolutionary propaganda. 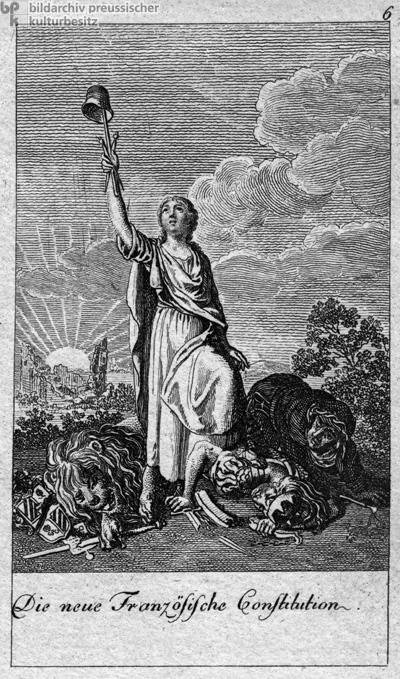 This 1791 engraving from the series Sechs grosse Begebenheiten des vorletzten Decenniums [Six Great Events of the Last Decade] (1792) shows a triumphant female personification of the newly promulgated French constitution towering over the fallen representations of the defeated ancien régime – the aristocracy (the lion with the fractured coat of arms and insignia), the monarchy (the crowned figure with the broken sword), and the clergy (the crouching figure on the right). Set against the backdrop of the rising sun, the upward-gazing female allegorical figure represents the dawn of a new era; she holds up the bonnet rouge, the symbol of the revolutionary Jacobins. Copperplate engraving by Daniel Chodowiecki (1726-1801), 1791.